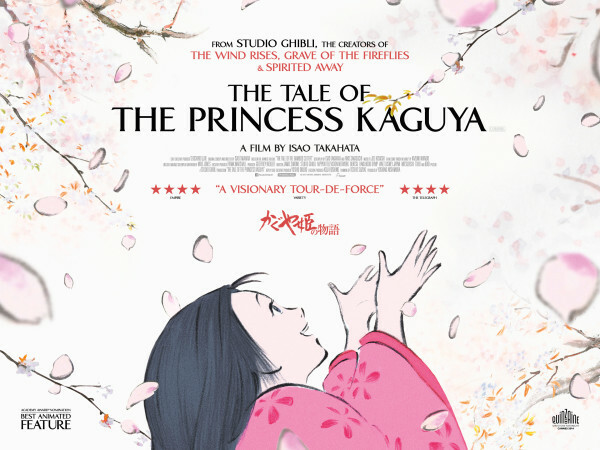 There is a strange kind of irony to the release of The Tale of the Princess Kaguya. It comes to the UK after Hayao Miyazaki – Studio Ghibli’s founder and its most prominent director – announces his retirement, with the Studio as a whole entering a break from production that many take as a signal of the end of times. Yet in the midst of this, The Tale of the Princess Kaguya presents us with Ghibli at its most bold and inventive: In its animation it displays an incomparable craft, a visual imagination, a daring beyond anything they have attempted before. In story it gives us a near-perfect blend of comic whimsy and subtle sadness, one of the finest they have ever written. How ironic it is that now, when they may be facing the end, Ghibli produce a film that feels like a fresh start, a masterpiece from a team reinvigorated and emboldened. An adaptation of an ancient Japanese fairytale, The Tale of the Princess Kaguya tells the story of a lowly farmer who discovers a magical child inside a bamboo stalk. The farmer and his wife decide to raise the child as their own, an extraordinary little girl who ages several years each day, and who brings with her all the riches of the world. Convinced that she is ordained by God for greatness, they move to the city and train her as a ‘true lady’, a Princess who must be ever perfect; hidden from view, heard but never seen. Director Isao Takahata always lends his films a kind of darkness that Miyazaki never really approached. Whether in the all-out bleakness of Grave of the Fireflies or the simple melancholy of Only Yesterday, he’s never been afraid to tell stories as much about what is lost than what is won, and with The Tale of the Princess Kaguya, he lifts a simple fairytale in to something far richer. While the story is simple, it finds depth through its refusal to paint Kaguya as solely a ‘tragic’ character, or to trivialise itself with too much comedy. Instead, we have a tale that rings with a profound emotional honesty; the highs and lows of her life mirroring our own, its themes universal. Artistically, Ghibli have never been better, nor so different. Styled after an old Japanese scroll, all watercolours and chalk outlines, even simple scenes are embued with a rare beauty. And while the film is often static, when it does decide to really move, the world becomes a blur of pencil lines and bleeding colours, ferocious and arresting. At times it becomes something you’d expect from a hungry, young animator’s first short, not a feature film helmed by a man in his seventies from an established studio over thirty-years-old. One particular sequence, in which Kaguya rushes through the forest, her face a madman’s scrawl as she dives towards the camera, is a moment of animation so breathtaking as to single-handedly justify an Oscar nomination. There is little to fault here: Undoubtedly – at 137 minutes – it’s a touch too long. It’s also worth noting how ‘un-Ghibli’ it feels in many ways. Relatively free of cute creatures or action set pieces, it proceeds at a stately, gentle pace that may turn off younger audience members. Howl’s Moving Castle this is not. Nonetheless, The Tale of the Princess Kaguya is one of Ghibli’s finest films in years. What it lacks in broad family appeal, it more than makes up for with artistry beyond compare. Yes, Princess Kaguya’s tale is a simple one, but it’s also one worth telling: Contained within it are all the accumulated joys and sorrows of life, a celebration of the difficult paths one must take, and a reflection upon what – in the end – you leave behind. The paths untaken, the words regretted and the words unspoken, and the precious moments that one can look back on, but never return to. This entry was posted on Monday, March 16th, 2015 at 7:27 am	and is filed under Features, Film, Review.